As magicians we forget magic is not for us. It's to leave our audience with a feeling or memory of something truly impossible... That's what the Shooting Star does. Their wish manifests itself into a real item they can take home with them after your performance. With Shooting Star they visualize their hopes or dreams onto a piece of “wish paper” and like the star itself it shoots across from one hand to the other and instantly becomes an origami star. But it's not the visual that's impressive, it's the storyline and presentation that sinks right in. Once a thought kept deep in their mind, but now materialized into something they can hold… Forever. • Secret gimmick - Makes sure you're always ready. • 5 Wish Bottles - For really special performances. • Pre-made origami stars - Plus instructions on how to craft more yourself. • Wish Paper - Enough for over a hundred performances. This really is a unique way to make an impact with your spectators, to do something that is more than just a visual. It has true meaning. It's moments like these in magic that leave your spectator with a lasting impression, putting you far above the rest. 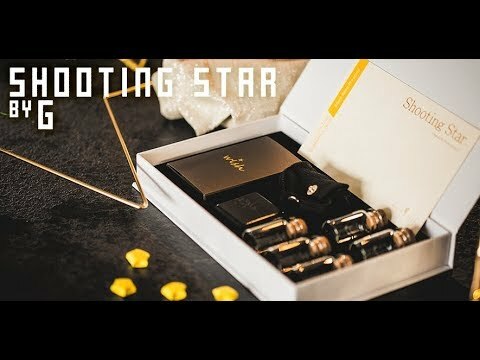 Not just card tricks or coins, Shooting Star is something the spectator can legitimately connect with, because it's THEIR wish. Suitable for all ages and super easy-to-perform.